March 6, 2014 by Ecommerce News. About Statistics with tags Austria, Czech Republic, Germany, Hungary, Poland, Slovakia, Slovenia, Switzerland. 3355 views. With an average growth rate of 19% in 2012 the ecommerce industry in Central Europe was growing almost as hard as the European average, which is 19.9%. The region’s ecommerce market was worth 75.9 billion euros in 2012, but it’s expected to have grown to 93.3 billion euros last year, which comes down to an increase of 23% in 2013. 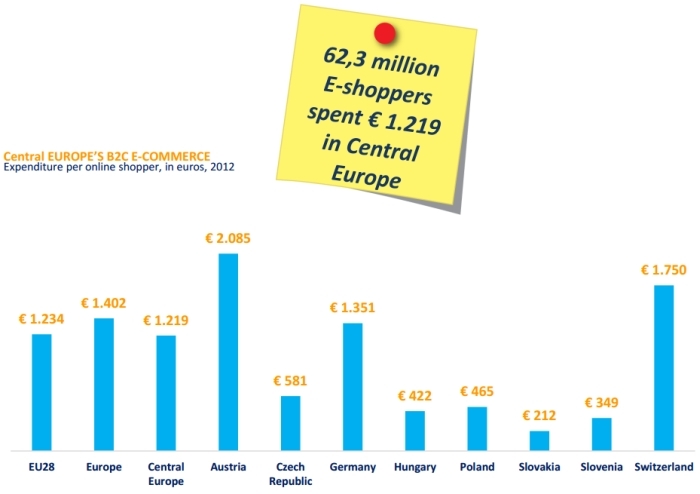 These numbers are coming from Ecommerce Europe, which revealed its latest report on ecommerce in Central Europe. The European organization looked at numbers from Germany, Austria, Czech Republic, Hungary, Poland, Slovakia, Slovenia and Switzerland and concluded that this region accounted for 24.4% of total ecommerce turnover in Europe in 2012. Germany is clearly the biggest ecommerce market in this region, as it had an turnover of 50 billion euros, followed by Austria (€9.8bn) and Switzerland (€9.1bn). 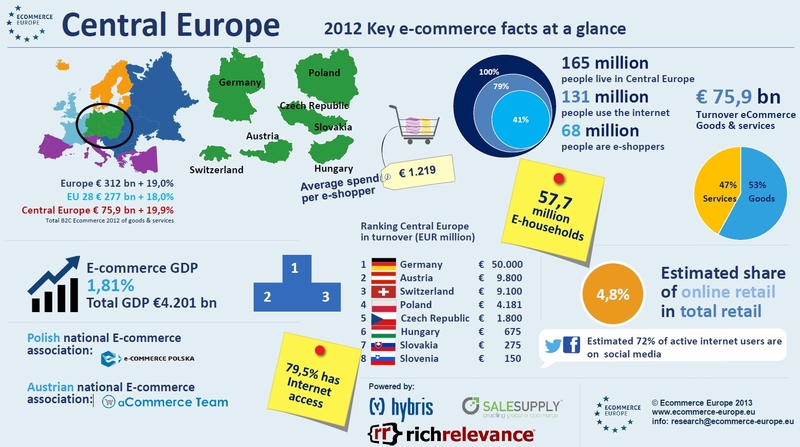 The German ecommerce turnover even makes up a third of the region’s total ecommerce turnover! When we look the slightly bigger picture, we see that Germany is the leading economy of Europe and second to the United Kingdom in terms of B2C ecommerce turnover. When we compare regions, it’s noticeable that the Central European is second to the Western European region. Whereas the latter makes up for more than half of total ecommerce turnover in Europe, Central Europe’s share is almost a quarter of the total online sales in Europe in 2012. Consumers in Central Europe spent on average €1.219 online in 2012, which is slightly below the European average of €1.402 Austrians happened to be the big spenders of this region: they spent on average €2.085. Switzerland and Germany follow with respectively €1.750 and €1.351. In its report, Ecommerce Europe made an in-depth analysis including infographics about the largest markets in the region, eg. Austria, Czech Republic, Germany, Hungary, Poland and Switzerland. To read more about these countries and check the latest data, please download the pdf. Northern European ecommerce to grow to €31bln.